Although a bit slow-growing, it is a worthwhile addition to any Highveld garden. Cassinopsis ilicifolia is a decorative hardy, evergreen, drought resistant, large shrub with shiny, green leaves and with green stems. 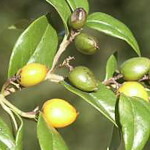 The small, greenish-white flowers are followed by orange berries that are much favoured by birds. It makes a good security barrier and can be clipped into a beautiful formal hedge. Cassinopsis ilicifolia is monoecious, so if you want fruit, plant at least three plants. Although a bit slow-growing, it is a worthwhile addition to any Highveld garden.